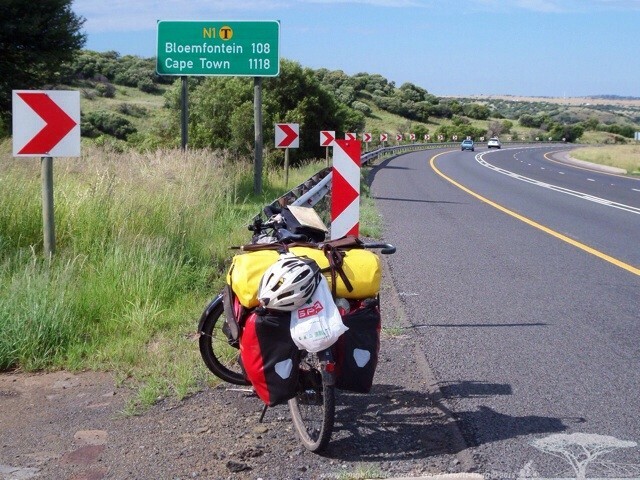 After recovering from my bout of Tick Bite Fever whilst I stayed with Chris and Brenda in Johannesburg, it was time to get back on the road. In all I was stopped for 13 days in Jozi, my bike sat unused in the porch. Chris advised a good route out of the city and my legs after their break seemed unwilling to cooperate without letting me know they didn’t like being stopped for so long. Stopping at the end of the first day they ached, much like when I had first taken up cycling. 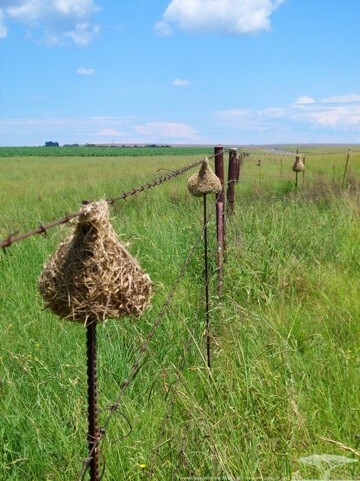 With Jo’burg e distance I headed further south on the way to Kestell and the Drakensburg. 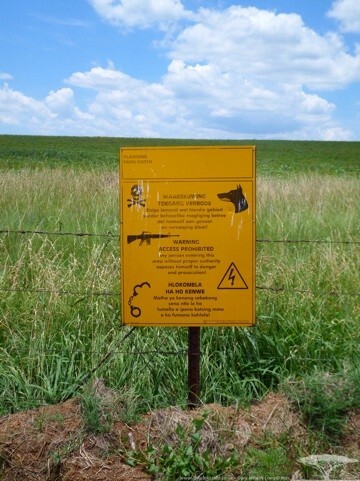 Camping or wild camping in South Africa is a little harder than in some other countries; there are fences everywhere with locked gates and several signs warning trespassers. The roads are being repaired and resurfaced between Reitz and Kestell leaving only a narrow slip of road for cars and lorries to pass. 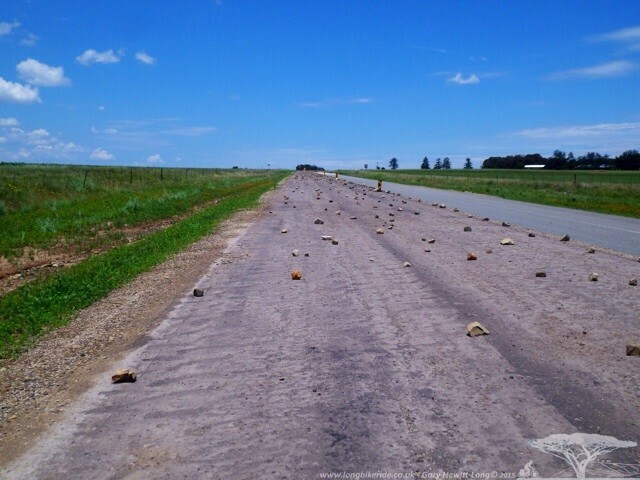 The safer option for a cyclist is to ride on the newer road and pick a line through the rocks that are placed on the new road to stop traffic using it until completion. 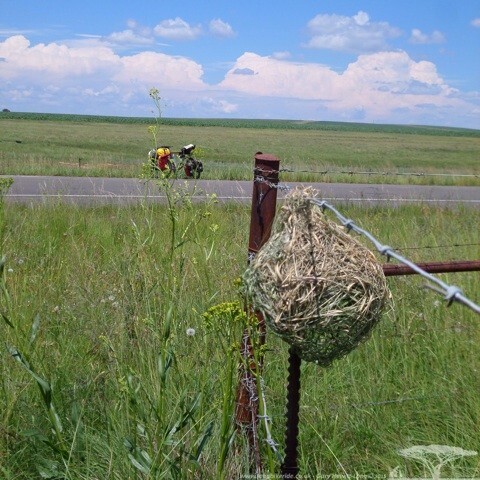 Weaver birds busy themselves building new nests; where there are no trees they build nests onto the barbed wire fences that line the roads. A good spot near water attracts several birds to build their nests. 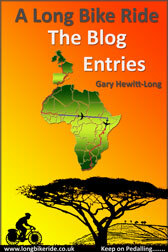 In Kestell, a small town on the edge of the Drakensburg and close to Lesotho I stay in a backpackers called Karma. Vera Ann the owner making me most welcome. My legs aching from cycling again are in a need of a day off, but one day off turns into 3 as my visa expires on the 20th March, there is no rush to get to Cape Town and return to a British winter. The added attraction of the Karma backpackers lodge is the free jam on offer, Vera Ann an award winning jams. Marmalade laced with whiskey or fruit jam with walnuts, too many wonderful types to mention. The day before I was due to get going again another traveller arrived for a weekend in the Drakensburg, Judith. Vera Ann warning her she should not go hiking alone and this was reinforced by another couple who had just come back from a hike, Bart and his girlfriend from Glasgow. 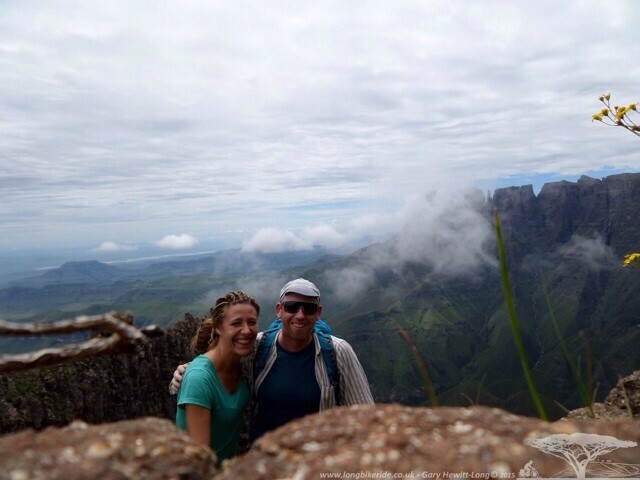 Judith asked if I would like to go with her on the Sentinel Peak trail which hikes up to the Tugela Falls. It sounded a fun, the trail being an hour’s drive away and Judith travelling by car meant we could get to the trail easily, much easier than I could ride there. 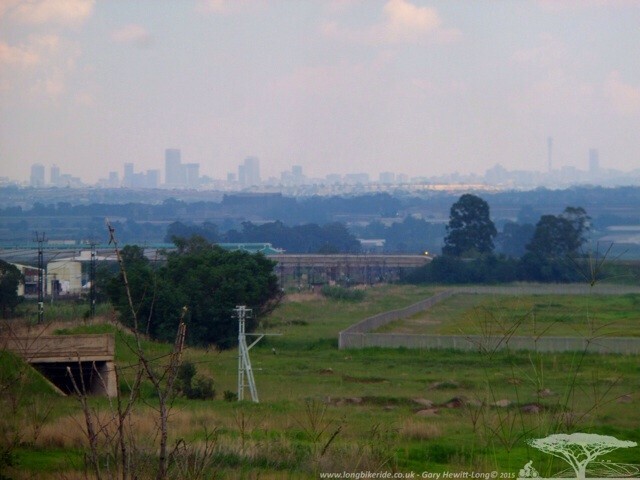 As we neared the Witsiehoek Mountain Resort where the shuttle takes you up to the edge of the park, the air gets cooler as you climb from 5,500 feet up to 7,200 feet. Walking up the trail there are not many signs to follow and the path occasionally seems to disappear. With the outstanding beauty all around the few signs there are, are easily missed as you look at the wonderful views. As you climb further up the trail you end up at 10,000 feet, around 3,000 Metres and you end up in the clouds. The final part of the ascent is via a couple of chain ladders. Although the path seems relatively safe people are still caught out and end up in trouble. Just before Christmas a hiker fell over the edge of the falls to his death. On top of the peak is a grassland which is reminiscent of Scotland. Clouds and mist all around and hardy sheep grazing. 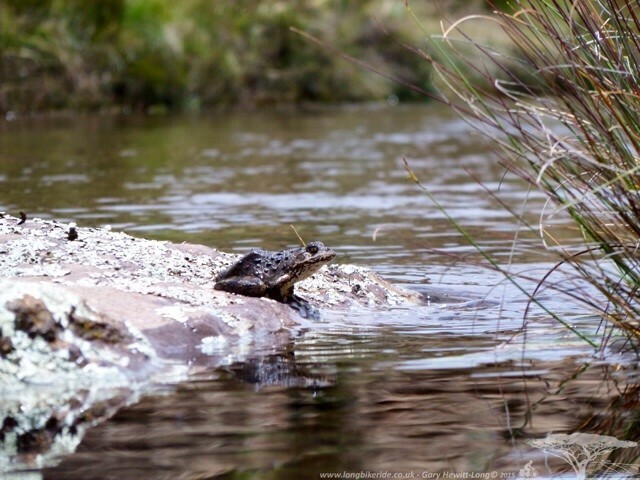 The streams are full of wildlife, small fish, frogs and there are lizards everywhere. 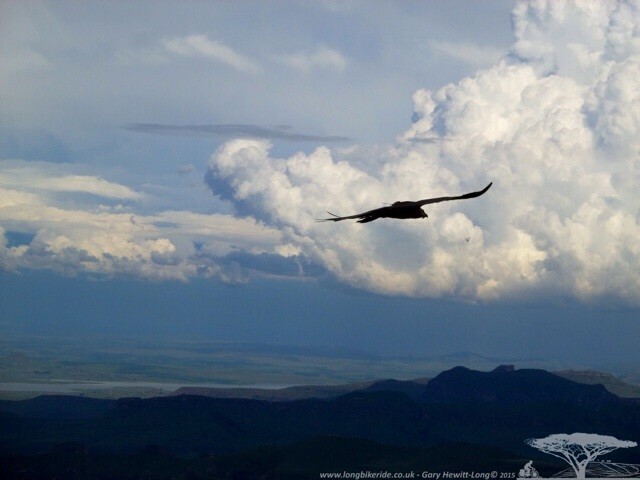 We were also lucky to see a bearded vulture as it soared majestically on the thermals over the peaks. Ivan a South African Hiker explained as we heard a baboon call that the one we could see was a sentry, looking out for the others. This lone baboon kept an eye on us as we walked back down and further explaining Ivan said the baboons living up at this elevation have a licker fur than their relatives in the Savannah. There is a hairy Baboon there, somewhere! Decisions Which Route? Cycling South Africa? Leaving Karma in Kestell I had three options to head toward Port Alfred. 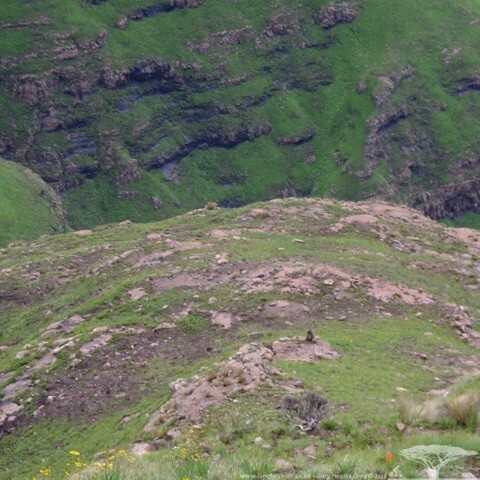 Riding through Lesotho a total of 55,000 Feet climbing, ride down through the Drakensburg, 44,000 feet of climbing or toward Bloemfontein, 24,000 feet. For the last 700 plus miles my knees have started to hurt a little and the 13 day rest in Johannesburg had not stopped this, another 3 days in Kestell and they still ached. Rather than push them through hills I decided to take the easy route, less scenic but hopefully better in the long run for my joints, since they started hurting my love of hills seems to have waned a little. The decision was also swayed by a story I had heard from Dave Conroy a long term cyclist who relayed to me in Lusaka the story of a fellow cyclist who ignored his joints complaints and is no longer able to cycle. Now that’d be a nightmare! Riding toward a town called Paul Roux a bakkie or pickup truck turned around in the road and pulled up in front of me. Out stepped a man who asked me about my trip and then explained he and his wife owned a Bed and Breakfast in the next town and I was more than welcome to come and stay the night for free. I arrived just in time, the heavens opened and I sought refuge in the village shop and made my way the Dunlin Bed and Breakfast in between downpours. 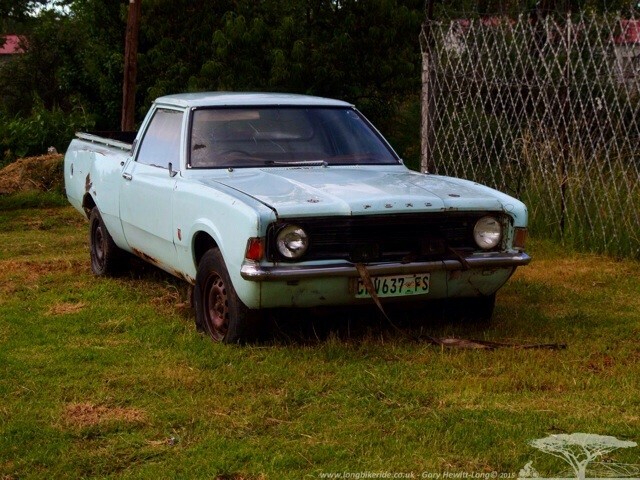 In the village was an old pickup/bakkie, made from a Mk III Cortina, a pickup never made available in the UK. I have noticed other pickups with Fiesta front ends. On arrival at Dunlin Bed and Breakfast, Theans and his wife Carolise made me very welcome, showed me my room and introduced me to some of their cycling friends. Theans and Carolise also own the coffee shop and antiquities store in the village, their house a treasure trove of old items and memorabilia. Several signs from old shops and garages, some I recognised from the UK. 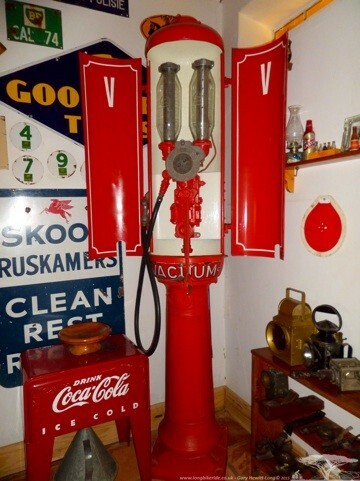 Even an old pump from a garage. And an assortment of old padlocks. You could easily spend a day looking around the place. The weather changes quick, roasting hot one minute and big rain clouds developing quickly and then suddenly letting go of their load in short time. 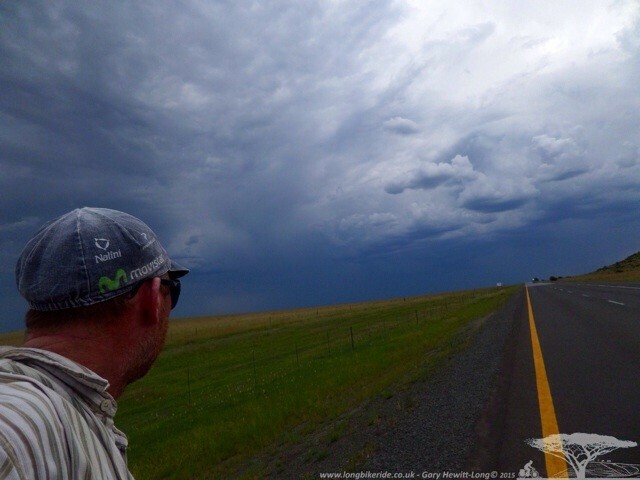 Riding toward Bloemfontein and before Winburg I could see storms and rain coming down. Overnight I stayed in Winburg, Danke SchÖn camping and guest lodge. Leaving Winburg I see my first sign for Cape Town, a reminder it’s not that far to go, although I am taking a longer route via the Garden Route. Heading to Bloemfontein I arrive to stay with Helen and her partner Andy, Helen whom I had met in Jollyboys Backpackers in Livingstone, Zambia kindly offered to put me up for a night or two if I came through Bloemfontein the judicial Capital of South Africa. 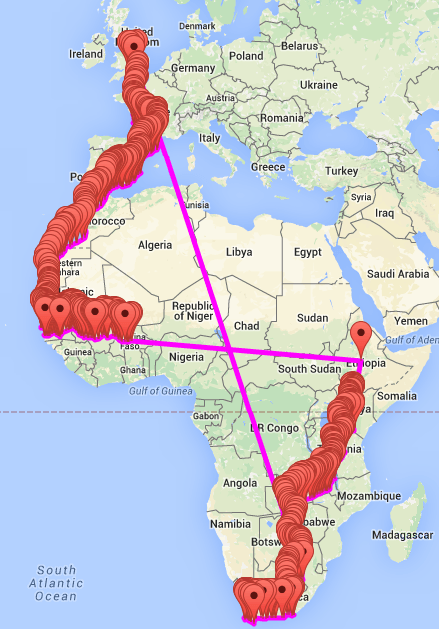 The next leg after looking around Bloemfontein will be down toward Port Alfred, then along the coast to Cape Town.